Smirl J.D., Wright A.D., Grewal H.S., Jakovac M, Bryk K, van Donkelaar P. Heart rate variability reductions following a season of sub-concussive head hits are related to the magnitude of impacts experienced. Smirl J.D., Wright A.D., Bouliane K, Bryk K, van Donkelaar P. Transcranial Doppler ultrasound measures of neurovascular coupling are maintained following acute sport-related concussion. Smirl J.D., Wright A.D., Bouliane K, Bryk K, van Donkelaar P. A history of multiple concussions does not alter the transcranial Doppler-based assessment of the neurovascular coupling response. Smirl J.D., Wright A.D., Bouliane K, Bryk K, Jakovac M, van Donkelaar P. Neurovascular coupling response is maintained despite exposure to repetitive sub-concussive head trauma over the course of one contact-sport season. Smirl J.D., Dierijck J.K., Wright A.D., Bryk K, van Donkelaar P. Effect of a history of 3+ previous concussions on centre of pressure variables during quiet stance. Smirl J.D., Dierijck J.K., Wright A.D., Bryk K, Jakovac M,​ van Donkelaar P. Effect of sub-concussive impacts sustained throughout a contact-sport season on quiet stance centre of pressure. Smirl J.D., Dierijck J.K., Wright A.D., Bryk K, van Donkelaar P. Effects of acute concussion on centre of pressure variables during quiet stance. Wright A.D., Smirl J.D., Fraser S.K., Bryk K, van Donkelaar P. A history of multiple concussions does not confer long-term impairments to dynamic cerebral autoregulation. Wright A.D., Smirl J.D., Jakovac M, Fraser S.K., Bryk K, Grewal H.S., Dierijck J.K., van Donkelaar P. Exposure to rotational acceleration over the course of one athletic season is related to impairments in an index of dynamic cerebral autoregulation. Wright A.D., Smirl J.D., Grewal H.S., Bryk, van Donkelaar P. Acute sport-related concussion suppresses heart rate variability beyond clinical recovery. Wright A.D., Smirl J.D., Bryk K, Fraser S.K., Grewal H.S., Jakovac M, Dierijck J.K., van Donkelaar P. Acute sport-related concussion induces transient impairment in dynamic cerebral autoregulation that is related to SCAT3 performance. Wright A.D., Grewal H.S., Smirl J.D., Bryk K, van Donkelaar P. History of multiple sport-related concussions alters variability of heart rate response to activity. Wright A.D., Fraser S.K., Smirl J.D., van Donkelaar P. Comparison of spiral versus block curriculum styles in preparing medical students to diagnose and manage concussions. Wright A.D., Bryk K, Jakovac M, Smirl J.D., van Donkelaar P. Examining the cumulative effect of repetitive head-impacts on the ability to inhibit a motor response. Smirl J.D., van Donkelaar P. Autonomic alterations in survivors of intimate partner violence. Smirl J.D. Cerebral autoregulation and concussions: what do we know and where should we go? Smirl J.D., Wright A.D., Ainslie P.N., Tzeng Y.C., van Donkelaar P. Differential systolic and diastolic regulation of the cerebral pressure-flow relationship during squat-stand manoeurvres. Wright A.D., Smirl J.D., Bryk K., van Donkelaar P. Systolic and Diastolic regulation of the cerebral pressure-flow relationship differentially affected by acute sport-related concussion. Smirl, J.D., Hoffman, K., Tzeng, Y.C., Hansen, A., Ainslie, P.N. Methodological comparison of active and passive driven oscillations in blood pressure; implications for the assessment of cerebral-pressure flow relationships. Smirl, J.D., Haykowsky M.J., Marsden, K.R., Nelson, M.D., Jones, H., Ainslie, P.N. 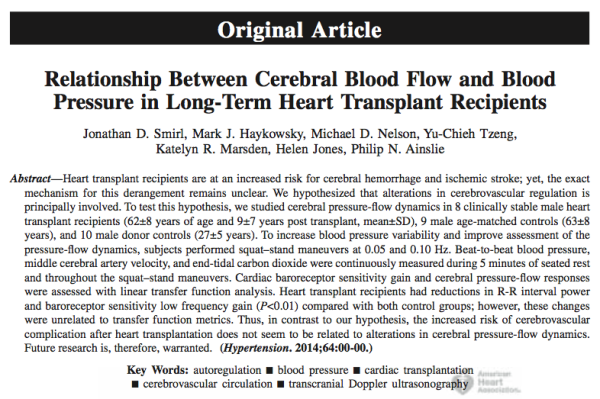 The relationship between cerebral blood flow and blood pressure in long-term heart transplant recipients. Bishop, S., Burnett, T., Smirl, J.D., Ainslie, P.N., van Donkelaar, P., Neary, J.P. Uncoupling of flow-pressure relationships following sport concussion in elite athletes. Neary, J.P., Butz, M., Dahlstrom, B., Smirl, J.D., Bishop, S. Effects of physical exertion and heat on cerebrovascular response in professional firefighters. Smirl, J.D., Lewis, N.C.S., Lucas, S.J.E., duManoir, G.R., Smith, K.J., Sherpa, N., Basnyat, A.S., and Ainslie, P.N. Cerebral Pressure-Flow Relationship in Lowlanders and Natives at High Altitude. Smirl, J.D., Ainslie, P.N. Influence of Cerebrovascular Resistance on Dynamic Cerebral Autoregulation in Humans. Smirl J.D., Jones K.E., Copeland P, Khatra O, van Donkelaar P. Physiological alterations within the cerebrovasculature in survivors of intimate partner violence. Smirl J.D., Jones K.E., Copeland P, Khatra O, van Donkelaar P. Intimate partner violence-induced TBI alters autonomic function metrics. Smirl J.D., Kates J, Wright A.D., Bouilane K, Dierijck J.K., Macauley A, van Donkelaar P. An acute bout of soccer heading augments cerebral autoregulation. Smirl J.D., Wright A.D., Bouilane K, Dierijck J.K., Burma J, van Donkelaar P. Sub-concussive soccer heading does not alter neurovascular coupling metrics. Wright A.D., Smirl J.D., Kates J, Bouilane K, Dierijck J.K., Siemens D, van Donkelaar P. An acute bout of soccer heading may alter autonomic function. Dierijck J.K., Wright A.D., Smirl J.D., Bouliane K, van Donkelaar P. An acute bout of soccer heading decreases postural control. van Donkelaar P, Dierijck J, Bouliane K, Wright A.D., Smirl J.D. A History of Concussion Does Not Lead to an Increase in Ocular Near Point of Convergence. Bryk K, Dierijck J.K., Bouliane K, Wright A.D., Smirl J.D., van Donkelaar P. A bout of soccer heading induces acute reductions in complex sensorimotor function. Kennefick M., Smart S., Wright A.D., Dierijck J.K., Bouilane K, Smirl J.D., van Donkelaar P. Impact of an acute bout of soccer heading on postural adjustments in complex tasks. Smirl J.D., Wright A.D., Bryk K., Fjeld K., van Donkelaar P. Diminished cerebrovasculature buffering capacity after repeated concussions. Wright A.D., Smirl J.D., Fjeld K., Bryk K., van Donkelaar P. Temporary impairment in buffering capacity of the cerebrovasculature to blood pressure changes in sport related concussions. Bryk K., Wright A.D., Smirl J.D., Fjeld K., van Donkelaar P. The effects of concussion history on response inhibition. Dierijck J.K., Smirl J.D., Wright A.D., Wallace C, Byrk K, Bouliane K, McNulty J, Purpur J, McLeod M, Kennefick M, van Donkelaar P.
Wright A.D., Smirl J.D., Wallace C., Bryk K., van Donkelaar P. Indications of impaired cerebrovascular buffering of rapid blood pressure changes following one season of participation in contact sports. Burma J.S., Macaulay A., van Donkelaar P., Smirl J.D. Dynamic cerebral autoregulation across the cardiac cycle during 8 hours of recovery from acute exercise. Ellis L.A., Ainlsie P.N., Smirl J.D., Tallon C.M., Simair R.G., Sletten N.R., Morris, L.E., Armstrong V.A, McManus A.M. Cerebral blood flow during progressive exercise to exhaustion in children and adults. Kostoglou K, Wright A.D., Smirl J.D., Bryk K., van Donkelaar P., Mitsis G.D. Concussion and cerebral autoregulation in young athletes. Dierijck J.K., Wright A.D., Byrk K, Smirl J.D., van Donkelaar P. Postural control is transiently altered following acute concussion. Dierijck J.K., Wright A.D., Byrk K, Smirl J.D., Jakovac M., van Donkelaar P. Postural control is maintained despite a season of sub-concussive head impacts. Smirl, J.D., Hoffman, K., Tzeng, Y.C., Hansen, A., Ainslie, P.N. The relationship between blood pressure and cerebral blood flow during supine cycling: Influence of aging. Wong, L.E., Smith, K.J., Koelwyn, G., Smirl, J.D., Ainslie, P.N., Eves, N.D. Alerting oxygen tension during exercise does not effect flow mediated dilation in healthy young males. Smirl, J.D., Haykowsky, M.J., Tzeng, Y.C., Marsden, K.R., Jones, H., Nelson, M.D., Altamirano-Diaz, L.A., Ainslie, P.N. 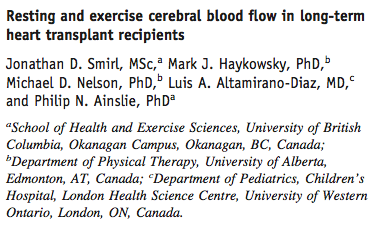 Cerebral blood flow in heart transplant recipients: rest and exercise. Bailey, D.M., Jones, D.W. , Sinnott, A., Brugniaux, J.V., New, K.J. , Hodson, D., Marley, C., Smirl, J.D., Ainslie, P.N. Dynamic cerebral autoregulation remains preserved in professional boxers. Hodson, D., Gibson, R., Jones, D.W., Sinnott, A., Brugniaux, J.V., New, K.J., Hall, J., Smirl, J.D., Ainslie, P.N., Bailey, D.M. Neurocognitive function across the spectrum of high contact sports. Brewster, K., Smirl, J.D., Bourns, K., Colino, F., Ainslie, P.N., Binsted. G. Effects of visual deprivation on regional cerebral blood flow velocity and neurovascular coupling. Smirl, J.D., Ainslie, P.N., Tzeng, Y.C., Marsden, K.R., Jones, H., Nelson, M.D., Dolinsky, V., Haykowsky, K, Haykowsky, M.J. Alterations in arterial-cardiac baroreflex and dynamic cerebral autoregulation following heart transplantation.